These last few weeks of winter can be the longest and gloomiest of the season. Just when the witch hazel begins to bloom, five inches of snow will fall and smother her glorious, golden petals. Late February and early March is my favorite time of the year to fantasize about a warm-weather escape. But when jetting off to a tropical island isn’t in the realm of possibility (raising my hand here), a weekend staycation filled with indoor gardening projects is often just the ticket. 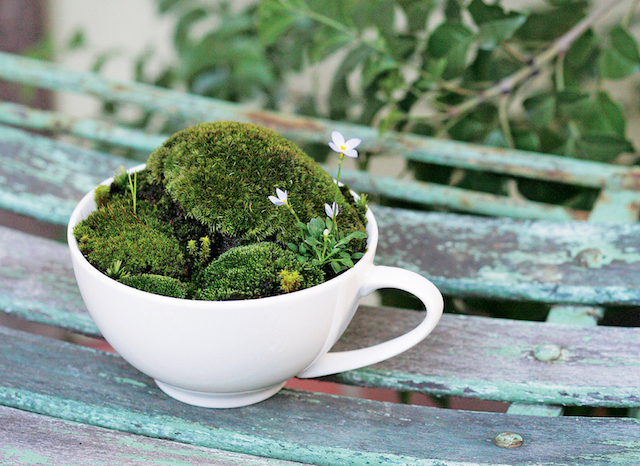 Miniature Moss Gardens, by Megumi Oshima and Hideshi Kimura, has inspired me to ignore the sleet and snow, and focus on the fresh scent of potting soil, sheet moss and ivy. Looking to bring new life to your winter-weary interior? Perhaps share the hope of spring at your office? There’s nothing like a pop of green to remind us that soon our season will change. 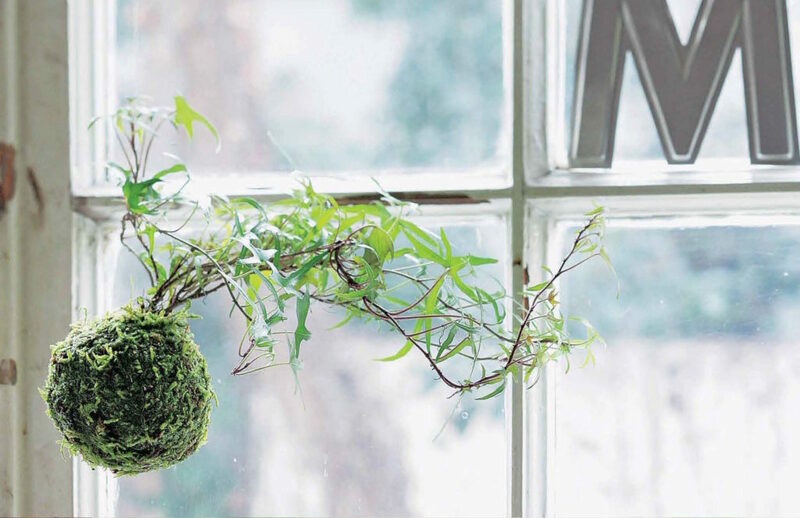 This beautiful how-to book is filled with indoor garden projects ranging from the simple (tea cup houseplants and tiny moss balls), to the complex (bonsai, tray landscapes or terrariums!). I review many beautiful, inspiring garden books —but to be honest, few of them offer the detailed, step-by-step instructions required for true horticultural success. 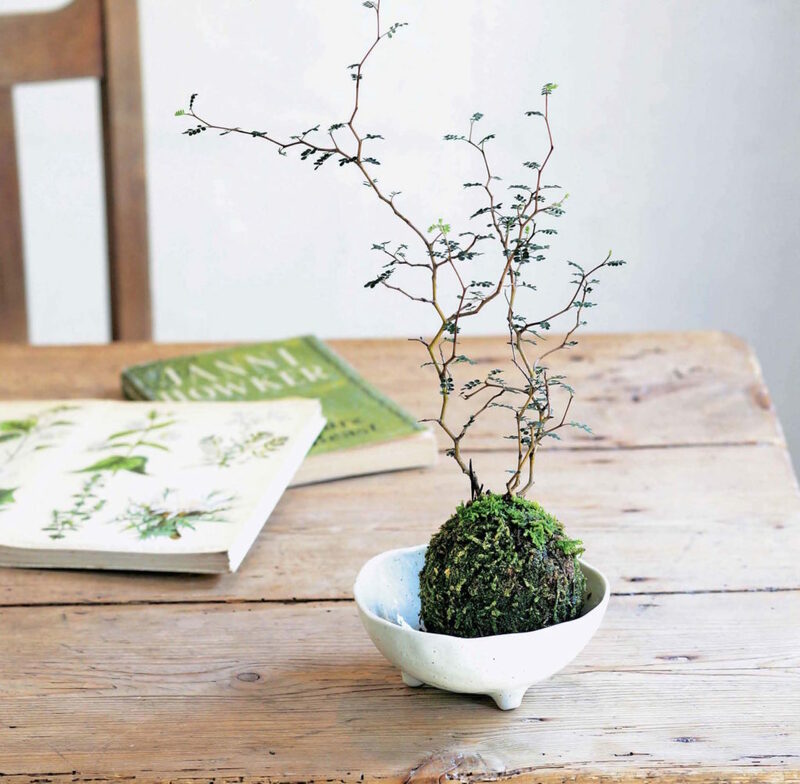 Miniature Moss Gardens is far and away one of the best how-to gardening books that I’ve seen in a long time. 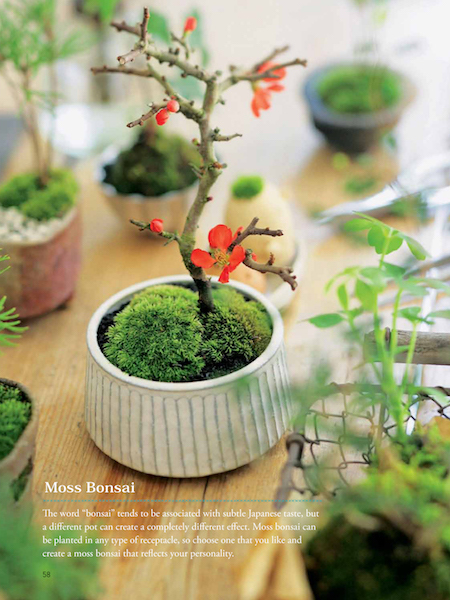 Authors Megumi Oshima, a plant consultant and interior designer with her own gardening shop, and Hideshi Kimura, a bonsai master and instructor with more than 20 years experience in his art, take the time to explain how moss grows, what it needs to thrive, and why it makes a great house plant. Not only are detailed supply lists and project instructions included in this book, but tips for maintaining your living creations are also provided for long-term success. 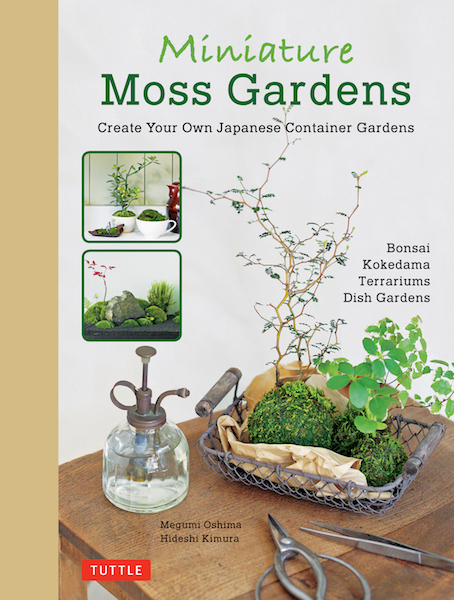 Horticultural geeks like myself will be delighted by the inclusion of a moss identification and location guide as well as propagation tips —perfect for gardeners of all ages. Ah, the seductive power of summertime annuals! With all of the lush foliage, boldly colored flowers and twisting, trailing vines tumbling from covered porches, it’s hard to deny the romance of flowering baskets. And now that we are in late July, those container-grown annuals should be at their vibrant best. But this has been a tough growing season in North America, with long dry spells and scorching heat testing a gardener’s skill and stamina. How are those annual containers looking these days? Things seem a little worse for the wear? 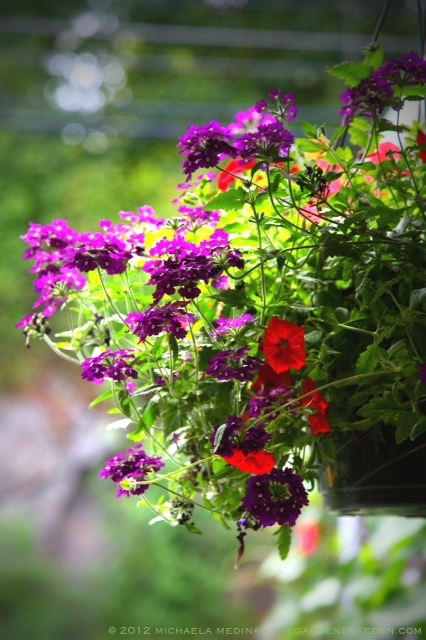 1) Water, water, water: In summer, it’s usually necessary to water hanging baskets daily; particularly when rain is scarce or when pots are hanging beneath covered porches. During hot spells, sometimes plants will need water twice a day. The ideal time to water plants is in early morning. Check moisture levels in the center of the plant and around the side of the container. I like to use a hose with a wand attachment for watering; positioning the rose at soil level in order to avoid wetting foliage. Dry foliage is less susceptible to fungal infection. I use a two-step approach to watering baskets; soaking the pot until water drains from the base —waiting a few minutes— and then soaking again. 2) Assure good drainage: As the season progresses, annuals have a tendency to form dense root balls. Sometimes, root balls become so congested, that water can no longer penetrate and instead rolls off the top of the basket. Last year during her seminar on container gardening at Walker Farm, my friend Daisy shared a great tip for solving this problem. Using a simple wooden dowel or skewer, push down through the root ball in several places to allow the free passage of water. It’s amazing how well this works to revitalize a hanging plant! 3) Feed me Seymour: During the growing season, it’s important to fertilize plants once a week. I like to feed annual plants with a water-soluble plant food, in the early morning, before the heat of the day. I water the basket first, and then water again with the fertilizer-mixture. In addition, I find that a once-monthly application of Epsom Salts solution (see recipe below) makes for a particularly enthusiastic floral display. 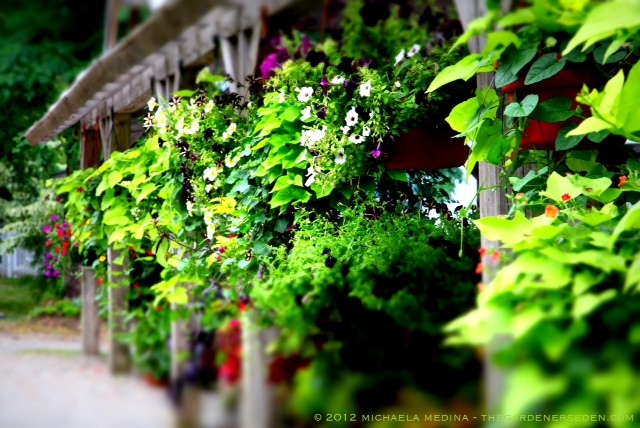 4) Right Plant, Right Place: Hanging basket not blooming? Most annuals require full sun to produce flowers, but of course there are some exceptions to this rule. 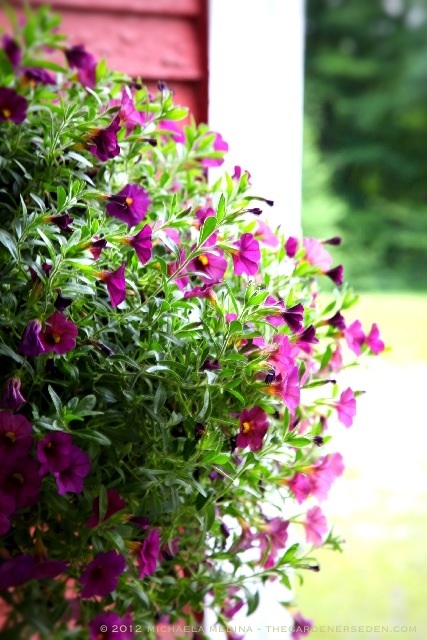 Most fuchsia and begonia plants prefer partial shade, but lobelia and petunias demand full sun. 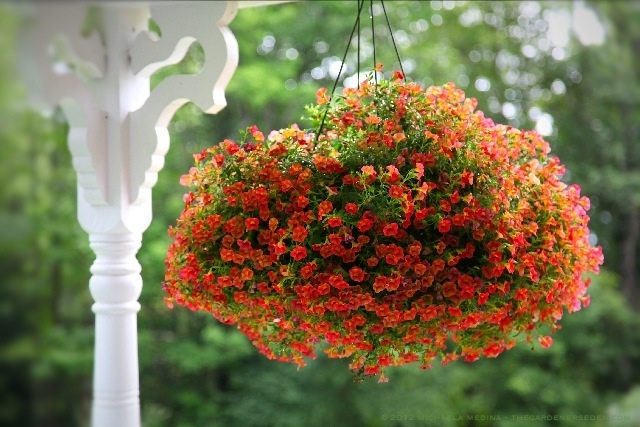 When selecting a hanging basket, it’s best to make a note of how much light the chosen spot will receive, in order to select the right plant for the location. Check the plant’s tag if you are unsure of the species you are growing, and if care instructions aren’t given, Google that plant to find out what it needs! 5) A snip, snip here & a snip, snip there: Pruning and deadheading hanging baskets can do wonders for improving their mid-season appearance. Use a clean, sharp pair of scissors or pruning shears (a rag soaked with rubbing alcohol works well for cleaning garden tools) and cut away any straggly vines, withered, broken or dead stems and spent flowers. Some annual plants will actually go to seed and stop flowering if they aren’t deadheaded, so I like to pinch off withered blossoms daily, just below the pod. 6) Emergency Rx: Even the best gardeners sometimes forget their plants. Unplanned absence from home? Bring your withered basket indoors and set it in a tub of tepid water; letting it soak until it begins to revive. Drain water and bring the plant back outdoors to a shady spot while it continues to recover. Fill a gallon sized watering can with tepid water (or warm a can of water in the sun) and mix in 1/2 cup of Epsom Salts until dissolved. After watering as usual for the first round, return to each basket with the Epsom Salt solution. Avoiding the foliage, pour about a half a quart of solution into each hanging basket. Repeat monthly throughout the growing season. You are currently browsing the Hanging Baskets category at The Gardener's Eden.